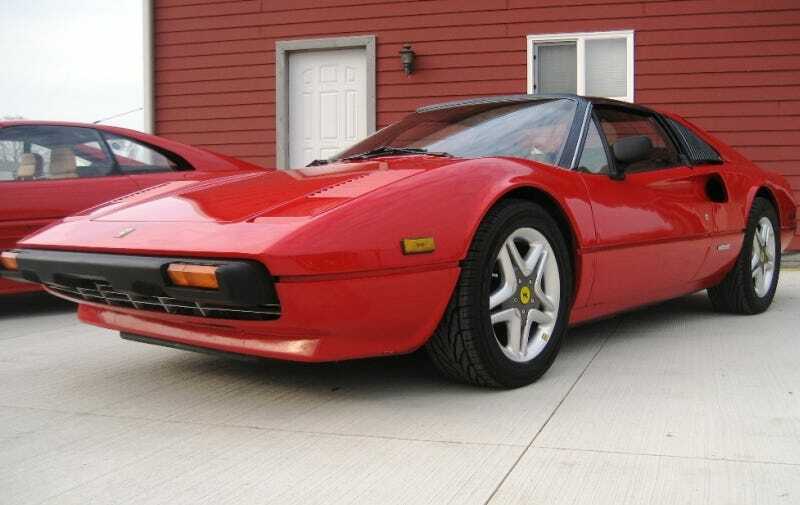 Here's a nice Ferrari 308 GTSi selling on eBay with a suspiciously low bid. Why? Oh, it's got a Pontiac Fiero engine. We present to you the world's first reverse Fauxrarri. Hey, nice example. I always like the 308s, even though they wear the stink of the 80's like a cheap perfume, they do wear it well. Man, this one's sporting some heinous MOMO wheels, but those are an easy swap for something lighter or more factory. Boy oh boy, this thing is clean! Not even a crack in the tail lights, and only one bid at $12,999! No self, NO, you do not need a Ferrari, even if it's a clean example There's gotta be something atrocious going on in the interior... hmm, everything seems to be up to snuff — actually this thing's clean as a whistle, the leather isn't even cracked or dry. It looks like it might even have the documentation in the passengers seat. Urge to bid... rising. Wait a minute, this might be some chump trying to pass off a really well done Pontiac Fiero kit-car Fauxrarri as the real McCoy, we see those on Jalopnik all the time. Wonder if there are any number plates to authenticate it. Oh hey, there they are, both the door jamb plate and the Pininfarina sticker. Wow, how do I tell my significant other I've bought another car and this one will be broken more than it's on the road and cost more to maintain than my mortgage? This might be the stupidest modification to any car in history. And he's trying to sell it as a good thing? What's this "MAKE IT REAL EASY TO FIND PARTS AND GET IT WORKED ON. NO SPECIAL FERRARI MECHANIC NEEDED. "Guess that explains the reason for the low-low reserve and low bid count. It also explains the bile taste rising in the back of my throat. The weird part is it seems this guy knowingly bought the car this way. What kind of world are we living in? This has been an excerpt from a day in the life of an eBay autos shopper.